Why travel far to enjoy a luxurious getaway when you can recreate the experience at home, in your own hotel-style bedroom? A hotel room is designed to pamper, relax, and refresh wary tourists. A stay at a 5-star hotel is the pinnacle of luxury and sophistication. 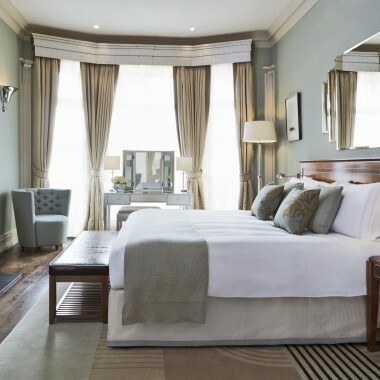 What makes a hotel bedroom so cozy and inviting? It’s all about the bed. 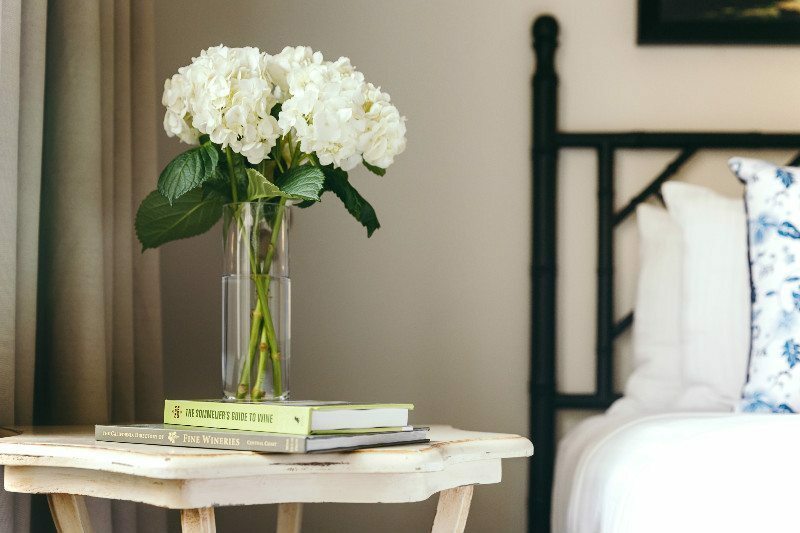 The secret to perfecting that cocoon-like, hotel-worthy bed is smart layering. Investing on fluffy white sheets is the first step to getting the bed styling right. 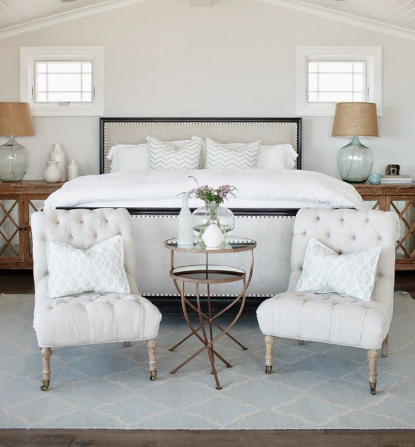 Go for a set of neutral or light-colored linens with a high thread count for a luxurious feel. Sheets with graphic borders are a great alternative if you’d like to accentuate the bed. For the thread count, aim for 400-thread count sheets or Italian cotton. Change the pillowcases, give the pillows a good fluff then, prop against the headboard. Layer the color coordinated sheets, runner, and comforter to create a fluffy, comfy, and inviting bed. Add a pop of color by placing a couple of elegant throw pillows. 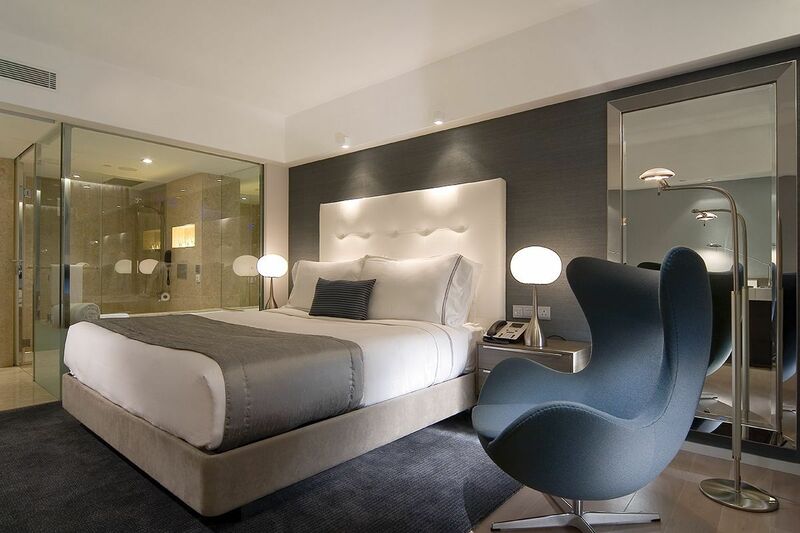 Luxury hotel rooms have a seating area and if your bedroom has room for it, get crackin’. Set a lounge or a couple of comfy chairs on a corner, preferably near the window or the foot of the bed. 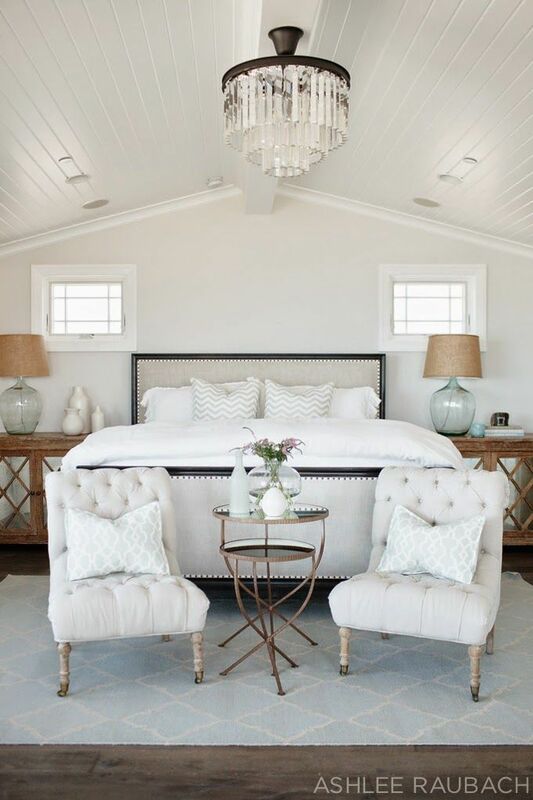 If the seating area cannot accommodate bulky pieces of furniture, opt for a tufted long ottoman bench topped with a couple of throw pillows to get the same look. Set a small table near the lounge/chair for coffee or wine. Place a couple of magazines on the table and a small décor to finish. Set the mood with the perfect lighting. 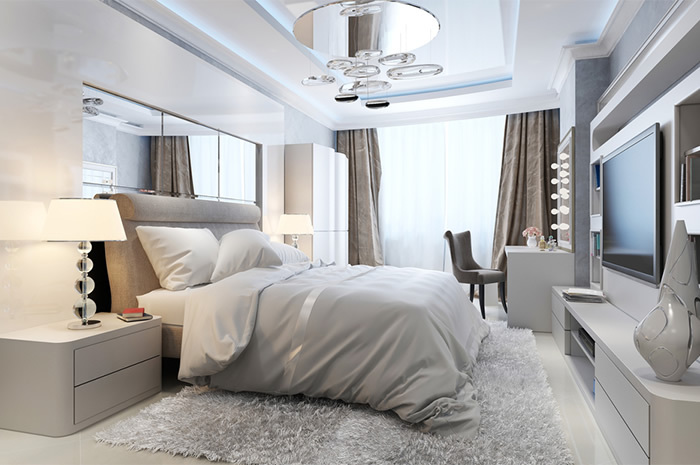 Again with the layering, you need to layer different lighting fixtures to complement the lavish interiors. 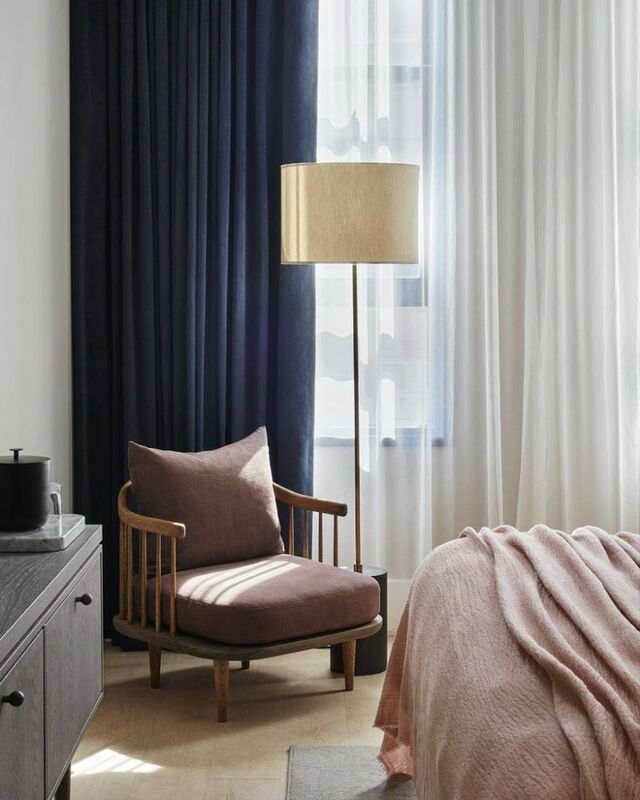 Don’t be afraid to experiment with pendant lights, dimmers, wall mounted sconces, table lamps, and statement lampshades to get the right effect. Opt for soft, warm lighting to create a cozy, inviting mood. Start with a bedside reading lamp on either side of the bed. A trio of pendant lights or a statement overhead light fixture adds drama and depth to the room. Place another lamp or two in the reading or seating area. Now that the bed and seating area are complete, it’s time to take care of the little details starting from the flooring. One of the best small apartment ideas for a hotel-like bedroom is to create soft, cozy flooring that matches the interiors. Cover bare floors with a shaggy rug or a soft, deep-pile carpet in a neutral color. The same thing goes for the seating area, add a rug in a matching shade for a cohesive design that soothes the senses. Of course, you can also go for a bold-hued carpets for a pop of color. 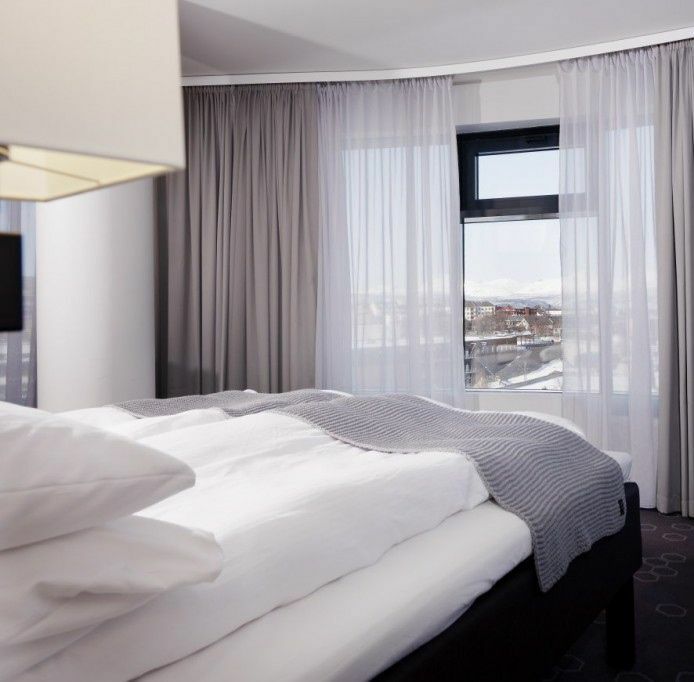 Drapes and curtains are some of the most important features of a 5-star hotel room. Window coverings create an intimate space for sleeping + they frame the bedroom. Because hotel rooms are all about symmetry, the drapes and curtains should match the rest of the interiors. Think rich fabrics, elegant details, silks, damask, and linens when shopping for curtains. Shades of neutrals are a safe choice if you’re unsure what curtain shades to pick. Curtains in contrasting color are perfect if the room is drowning in neutrals. Ideally, go for blackout curtains to control the amount of sunlight that enters the room. Layer the blackout curtains with sheer curtains to re-create the window coverings of a hotel room and give a sense of comfort. No luxury hotel room is complete without bedside refreshments! 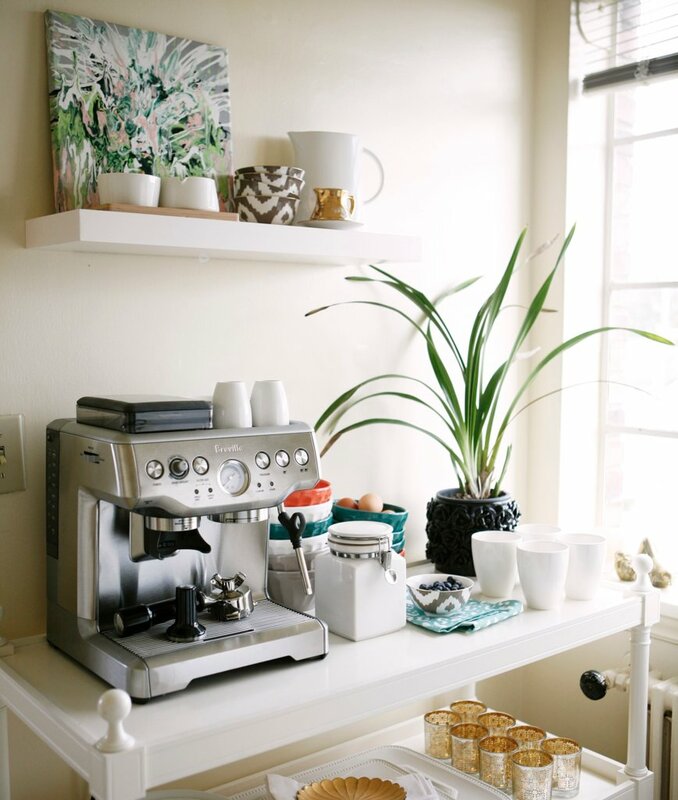 So assemble your own coffee and tea station by the bed. Place a coffee maker near the bed, add your favorite sweeteners as well as bottled water and other treats. Set a mini fridge on the other side of the bedroom and fill it with chilled drinks, spirits, etc., for a relaxing nightcap. Two of the most common room accents used in a luxury hotel room are artworks and greeneries. 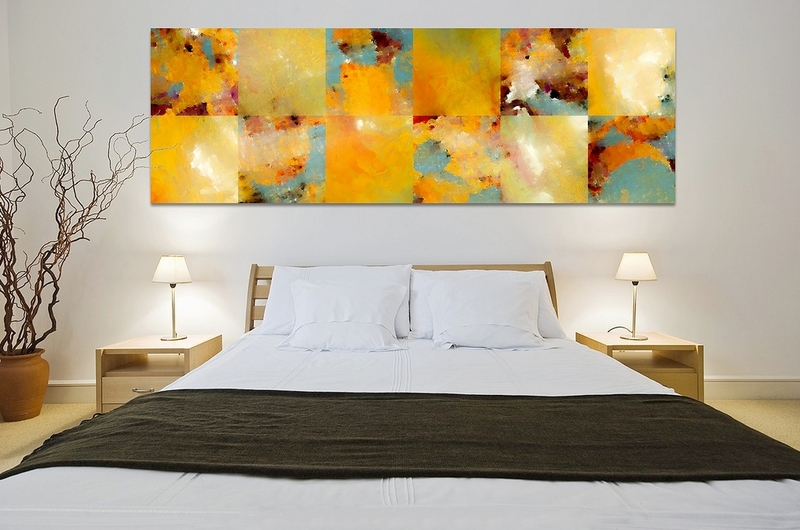 An art piece instantly glamorizes the room so hang a statement piece directly above the bed headboard. For the greeneries, a large houseplant set in the corner of the room or a bouquet of blooms on the entryway makes a huge impact on the overall aesthetics of the bedroom. Other details to consider are the bare nooks and crannies. The nooks and crannies should be optimized to serve a purpose. Use decorative baskets and bowls to organize little items and hide clutter. 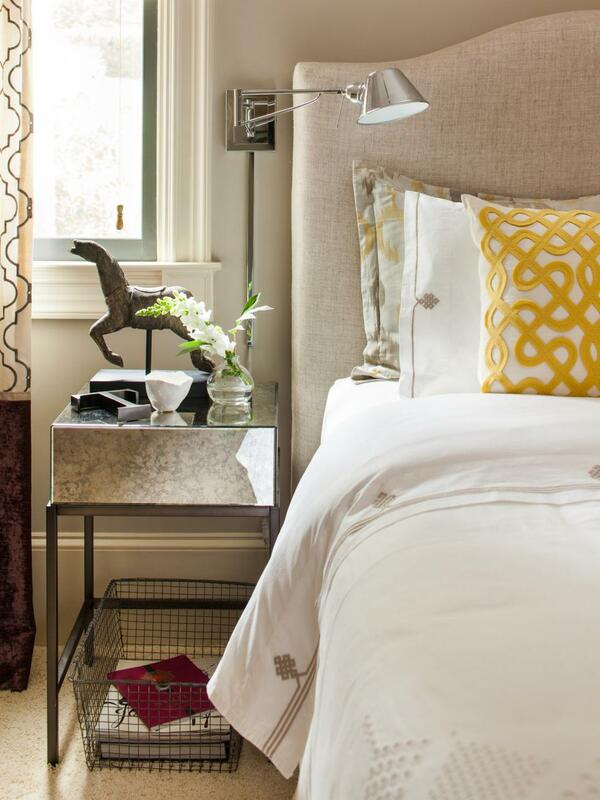 Dress the bedside tables with pretty vases and decorative lamps. Use the shelves to highlight your collections. 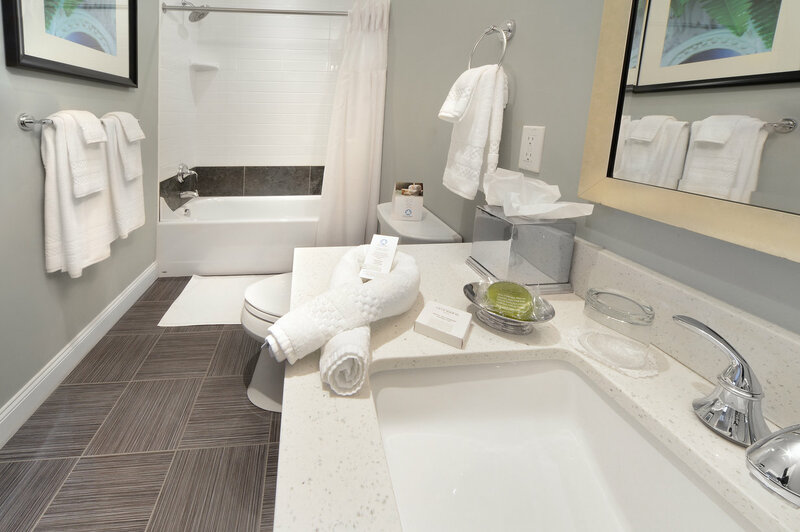 Of course, a hotel room always comes with a spa-like bathroom, a posh en suite that pulls all the design elements of the room together. 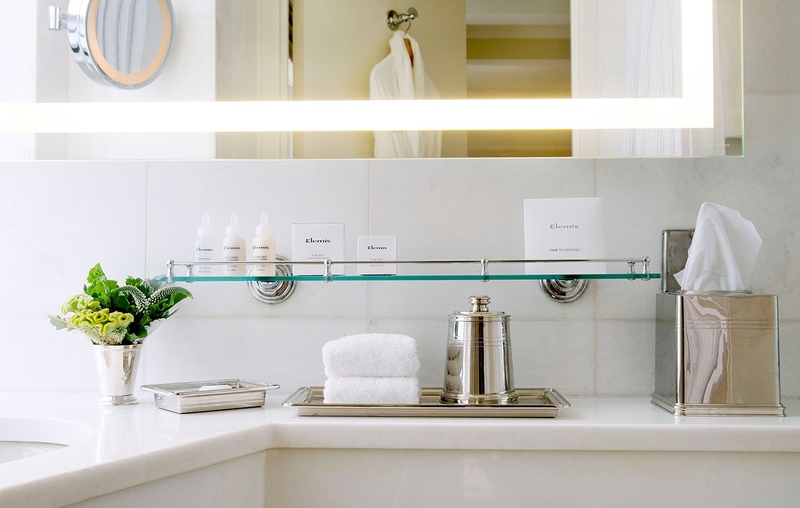 Of course, not all bathrooms have full body jets, a jacuzzi tub, and wall-to-wall mirrors. You can recreate the look by arranging a collection of luxury soaps, plush folded towels and hanging thick bathrobes by the sink. Use an elegantly-designed shower curtain, a couple of scented candles, bath bombs, mini shampoos, conditioner, etc. to elevate the look of the bathroom. Finish up by dimming the lights and running a bath. Loved these small apartment ideas? 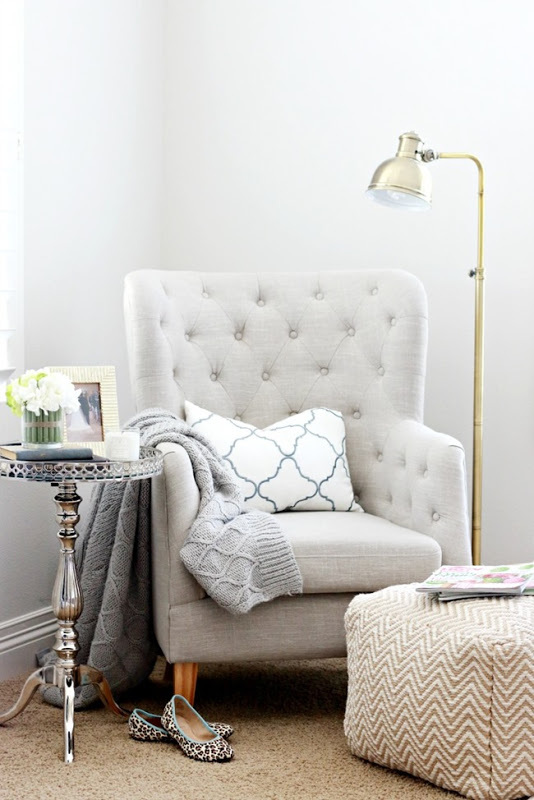 Stay tuned for space optimizing tips to create Pinterest-worthy home interiors!